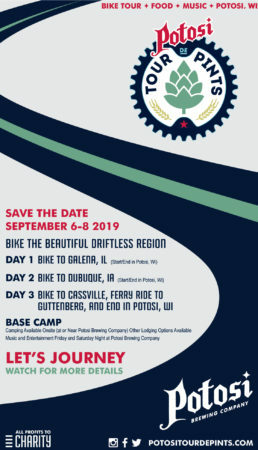 The Potosi Tour de Pints is a three-day bicycle tour of the gorgeous (and hilly) Driftless Area of southwestern Wisconsin and portions of Iowa and far northwestern Illinois. This tour begins Friday, September 6th and finishes on Sunday, September 8th with camping and lodging options, music, food, and more provided at the basecamp each night: Potosi Brewing Company. Day 1: Friday, September 6th, features a ride from Potosi south to Galena, Illinois. Galena is a beautiful community with rich history, and very popular with tourists. It’s just a few miles south of the Wisconsin-Illinois border. The ride heads down a variety of roadways from Potosi to Galena and then back, where music and entertainment await at the base a.k.a. the Brewery. Day 2: Saturday, September 7th, you’ll ride southwest from Potosi to Dubuque, Iowa, crossing the Mississippi by bridge into the city. The ride returns to Potosi later that day, where more music, entertainment, and of course craft beer await. Day 3: Sunday, September 8th includes a ferry ride across the Mississippi! You ride from Potosi to Cassville using Highway 133, cross the river on the Cassville Ferry to Turkey Creek, Iowa, ride to Guttenberg in Iowa, and then loop back to Potosi. More details will be released as September gets closer.